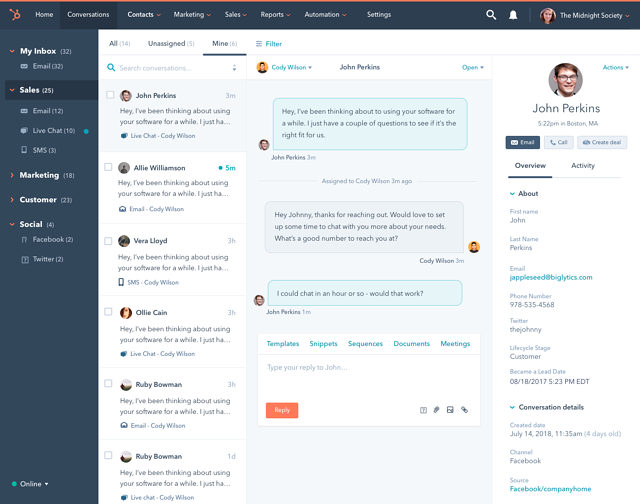 HubSpot, a leading CRM, marketing, sales, and customer experience platform, announced today the upcoming launch of Conversations, an addition to HubSpot CRM Free that will help teams manage, scale, and leverage one-to-one communication across their site pages, Facebook, Slack, and other messaging channels. Gartner predicts that by 2020, 30% of our interactions with technology will be through "conversations" with smart machines. Consumer behavior is already leaning in that direction – we kick off a conversation in person or over the phone, we follow up with a text message and then take it online to Facebook, email, or Slack. These conversations are fluid and portable. They move across channels and mediums, and we never miss a beat. Historically, brands have struggled to have these same kinds of natural, fluid conversations with prospects and customers at scale. HubSpot Conversations will give businesses the tools they need to do just that. Multi-channel: Conversations unifies conversations from Facebook Messenger, onsite chat, social media, email and other messaging outlets into one shared inbox. Scaleable with chatbots: Conversations will enable companies to build chatbots without needing technical skill and scale responses to match high volume inquiries. HubSpot Conversations draws insights from the company’s CRM and marketing data to give teams the full context of every interaction. With Conversations, teams can stay connected with customers and prospects at any time, wherever they are. Now a customer interaction that may start on Facebook can be picked up via live chat on the company site or wherever the customer prefers, with all communications synthesized in one central inbox. In the future, Conversations will also include chatbot technology from HubSpot’s recent acquisition of top chatbot platform Motion AI to help teams scale one-to-one interactions with artificial intelligence. HubSpot Conversations will be available as part of HubSpot CRM Free, and will be one of the first platform-level features available in the soon to be released HubSpot Customer Hub. Sign up for a free HubSpot account to get access to Conversations when it rolls out fully in 2018. To learn more about all of the announcements HubSpot made at #INBOUND17, please visit hubspot.com/new.